16 Port Chain Sync Breakout Board for HP, DELTA, LITE-ON Server Power Supply. 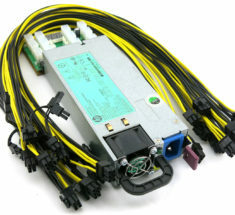 Dual PSU to Single hashing board fault protection "If one PSU fails the second PSU will shut off"
Inter connect cable, 1 to 2 X11 - One cable is included for each additional breakout board purchased together. Note: Not compatible with Dell power supply with Dell Part Numbers: TCVRR, 0GVHPX, or 0XCHHD. Hey joseph, any update on when X12 will be ready? I spoke with Missa last week but forgot to ask. Is there’s a way to get on a notify list when the x12 becomes available. Finally! My only concern is that I don’t see my PSU model listed. Joseph, will this model be supported? Compatible with Dell PSU’s ? However, it is not compatible with the part numbers 02RN7, Y1MGX, or C7JTF. We are working on designing a compatible breakout board. Joseph, is this model compatible? 1) Does this come with power supply? 2) What is the included cable for? 3) Is this “delta power supply” different than the common slot HP? 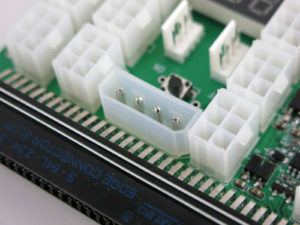 4) What is the molex connector used for? 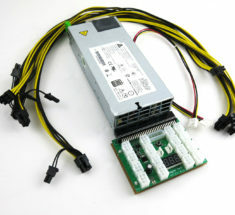 5) Is this designed to add power to an existing ATX power supply system? Thanks for your answers, answers in itemized fashion would most concisely answer my questions. Can I forgo using a standard ATX PSU to MB, and just Pico ATX PSUs to sync power on? Pico is a better / cleaner solution in my opinion. However it as limits. So, the only components you would be able to power would be the Mboard ATX / CPU 4pin/8pin “4pin fit in the 8pin socket” and a SSD drive. You cannot power Riser board with the Pico SATA power. These will need to be power by the server PSU. So the riser must have PCie power socket. The X11 has 16 socket and you can use a splitter between the GPU and its Riser. As always do the math on power requirement for your GPUs. Hi can you confirm if this will work with DELL N750P-S0 NPS-750BB A power supplies? Do you have a board that is compatible? Is it compatible with a Dell DPS-1200MB-1 A or DPS-1200MB-1 B or DPS-1200MB-1D? If so which one? Hello, is it compatible with- LITEON PS-2112-2L 1100w dell c6100? Joe- Did you send one of these to Savas to try? If not, I’d be willing to give it a try as I’d also like to know if it works with the PS-2112-2L. Yes it is compatible. I’m using it right now with it. Is it also compatible with a LITEON PS-2112-2LD 1100w ? It should be compatible, but we have not tested that particular PSU. We’ve had great success with the Lite-on 1100W PSUs so far; there is only one confirmed incompatibility: part number 0TCVRR. Hi, I have one of your Delta 2400w units with rev 7 boards, can I replace them with the X11 and more importantly do I need two X11 or can I mix and match keeping one of the rev 7? All I am trying to do is sync the Delta 2400w with a small ATX so I can turn them both on/off at the same time? Thank you! or with other breakout boards ? Hi, the X11 is described as being compatible with the DPS-1400AB but what about the DPS-1400BB? Hi will this support: LITEON PS-2112-2D1-LF, TCVRR 1100W PSU for Dell T710 T510 R910 R810? Model # is: L1100A-S0. Thanks! Hello, I just came into 8 of these power supplies (LITEON PS-2112-2D1-LF, TCVRR 1100W PSU for Dell T710 T510 R910 R810) Would love to use them on a mining rig. If you guys have a breakout board that will support these, please let me know. I just purchased a couple 1000watt HP PSU’s w/X11 boards and cables and ATX 180watt adapter from Missa (you guys). Liking everything so far! I would be interested in the X12 board… upon closer inspection this morning it appears the Dell/LiteOn PS-2112-2D1-LF has 8 runs + a positive/negative run on the end compared to the HP DPS-1200SB A which has 6 runs + a positive/negative run. The breakout boards fit, but the Dell/LiteOn will not power on with the X11. The TCVRR part number you mentioned is incompatible with the X11 breakout boards; it is the “one REV” Joseph was referring to. The different number of pins on the left hand of the power bar slot isn’t the issue as the X11 is designed to be compatible with both. Thank you Missa, hoping the X12 breakout board will make my PSU’s usable. BTW: Thank you for the excellent service with my order, everything was bubble wrapped and shipped very fast!! Thanks for the share … It does help. Any idea when will it be back in stock? 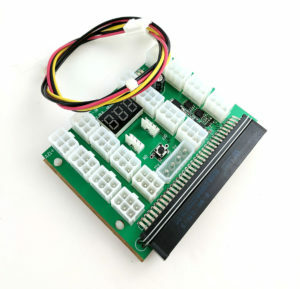 Hi, is this board compatible with DPS-2000BB ? We cannot as we have not try it. Would be happy to offer you FREE shipping and 100% return guarantee if it is not compatible. Just keep us posted here on the result. I’m having an issue with the X11. 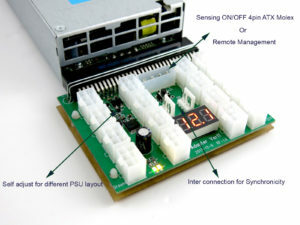 It is connected to a Delta DPS-1200MB-1 and an ATX PDU using the sensing 4 pin connector. It is showing 12.7V on its digital display but If I connect a single video card I can hear the Server PSU fan going from 5% to 100% and the PC crashes. If I run the whole system on the ATX PDU everything works. Model # HT6GX 1100watt PSU. Is it compatible with DPS-1200SB 1 B? I thought this works standalone by pressing the power button. This is not working for me.. am i missing a piece? 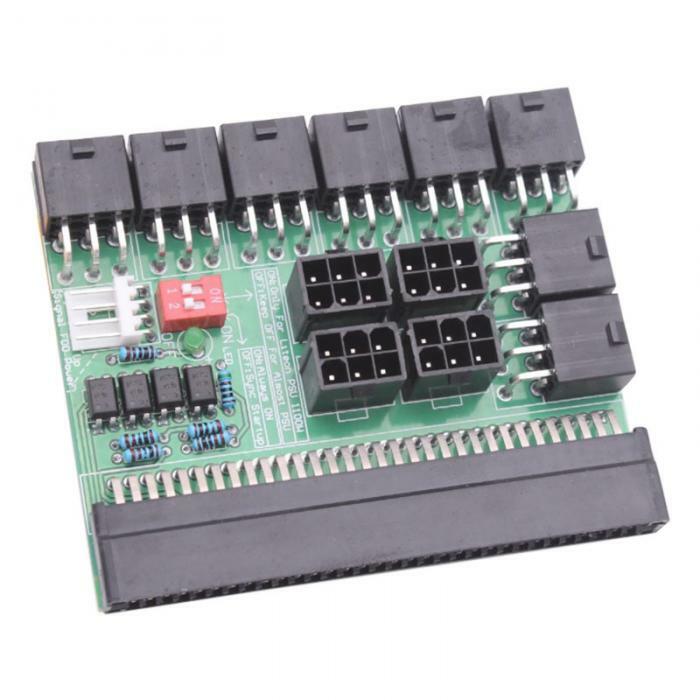 This is a breakout board only … what type of power supply did you use with it ? What 750 watt do you sell that this works with ? Is it possible to link this breakout board/server psu with my existing Corsair ax1200i and ax1500i? I’d like to just add additional power to the rigs I already have, as I still have some more PCI-E slots that will soon be filled. You can sync up one of your ATX power supplies to our server psu w/ X11 breakout board by connecting a molex plug from your ATX psu to connect to our molex port on our X11 breakout board. 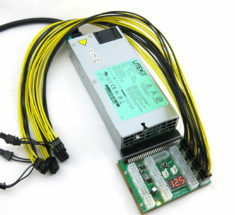 By doing this, our server psu will sync with your ATX psu and power on/off at the same time as your ATX psu. The molex plug, is the 4pin power cable that would be use on an Hard Disk Drive.. I bought a cable set from parallel miner , its a set of several “solid 6 to 6+2” cable for pcie. Just to be sure so I can plug this cable to the breaker (the solid 6) and at the other end i can plug it into the riser (the 6 part of the 6+2) ? This model is not … but we are working on a new model which will be available by month end. Unfortunately, it looks like they are not compatible. Thank you for testing the X11 with XCHHD for us. We look forward to you testing the X12 for us as well when it is available! don’t worry I’ll buy one to three over time 🙂 … or more . if this helps any link to the PSU …..
Hi would you pleas confirm that does it work with DELL POWEREDGE 1600W POWER SUPPLY 95HR5? Thank you for the inquiry. No, the breakout board is not compatible with that part number. It is compatible with LITE ON PS-2112-5L 1200W , for Dell PowerEdge C6100 ? We have not tested the breakout board with that specific PSU, so I cannot guarantee compatibility. That said, the X11 and X6B should be compatible. i saw a post 8 days a ago testing the x12 board any word when they go on sell ?….. or how is testing going ?. Its ongoing. Test result were not as expected, we are working on it. Pls tell more about X12. I want decide wait for X12 or buy X11. Thanks. Because I’m not sure for 100% that X11 will compatible with my PSU. Our X11 breakout board molex port works by detecting a 5v reading to activate its features. You will not be able to use the molex port on the X11 board to power up anything on your motherboard. Also our breakout board is not designed or intended to be used with any breakout board that is not ours. The X11 Breakout Board is a blessing. I have plugged and unplugged so many times while building and troubleshooting, at this point counting is irrelevant. All parts are solidly attached and properly built. The on off switch looked a bit flimsy at first glance, but it isn’t There is no give or movement when pressing the button. 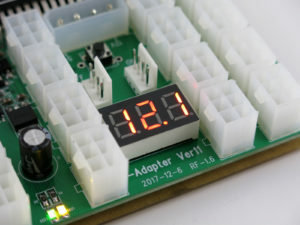 This board simplifies many the many cards and risers to plugs issue. It also allows me to run 220V server power supplies, which is a big plus to me. @Styxx – The X11 and X12 are both GREAT boards! If you are concerned with PSU compatibility issues, I recommend contacting Parallel Miner through any of their many channels. Live support via instant messaging is something nobody else in this industry currently offers, and they have responded to all of my past communications within 1 business day. 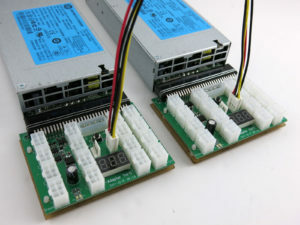 These boards are compatible with just about all of the popular server PSU’s miners are using, and include a chip for self-adjusting to the PSU. In addition to being the best quality, best built, and supporting the most features of any other boards on the market, I have found these to be the most compatible as well. 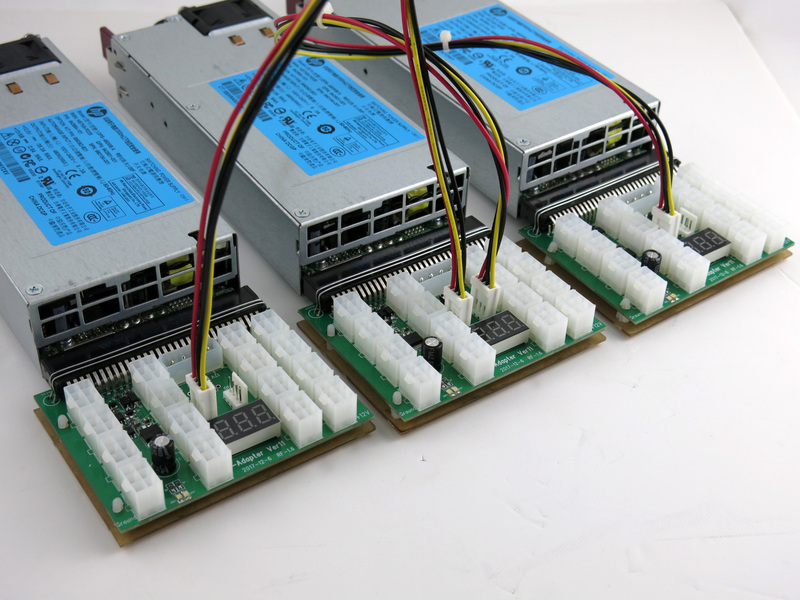 The breakout boards from Parallel Miner are the ONLY boards I trust to power all of my expensive (and often irreplaceable) equipment. I have been mining since 2010 and continue evolving with the industry, having tried breakout boards from just about everywhere along the way. These boards are in a class of their own in every way!